Incredible Dracula: The Ice Kingdom is rated 4.4 out of 5 by 23. Rated 5 out of 5 by mygames49 from I WANT MORE!!!!!!!!!!!!! I HAVE PLAYED ALL OF THE INCREDIBLE DRACULA GAMES. AMAZING. EVERYTHING ABOUT THESE GAMES ARE A 10+. WAITING FOR THE NEXT INSTALLMENT. WISH THEY HURRY UP. IN THE MEAN TIME, I'LL PLAY SOME OF THE GAMES AGAIN. Rated 5 out of 5 by AJLlewellyn from Just Love this Game! I stumbled across this game by accident. I'd run out of TM games and tried this and I think it's my new favorite. 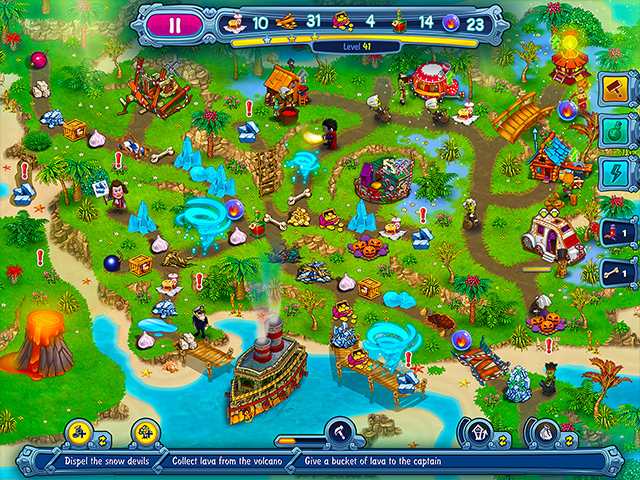 Love the game, the visual quality, the characters (I have a gigantic crush on Rupert)...I even love the noises some of them make as they collect resources. Have since purchased all the games in the series. This one has some real challenges and I had to play some levels a few times. It's worth it! Rated 5 out of 5 by Nocturne from Liked it First, I wish they hadn't changed the way they looked, I liked the wife looking more like Morticia, more vampire-ish. I do like that both Drac and his wife, and even the Princess have their roles in the Ice Kingdom; I really like the Princess kicks things to get rid of them (if you've played previous version of this game you'll know she isn't exactly gentle and kind). You don't get to buy new zombies, you're given a set number to work with. Once you've built the buildings, they will automatically send their products to the collection but will also toss out a product every now and then to be collected. I didn't find this version as challenging as past versions but it was still fun and something I'll replay until the next version comes out. I, too, would have preferred to buy the Collector's Edition but was too eager to play and couldn't wait (no guarantee a CE will come out either). Rated 5 out of 5 by Momma_Llama from More Dracula Fun! This game goes between Dracula and Elizabeth. It's a ton of fun and brings back a whole lot of what made the game fun in the first place. Rated 5 out of 5 by BFYvonne from Does not disappoint! Incredible Dracula is my favorite game series and this latest did not disappoint. 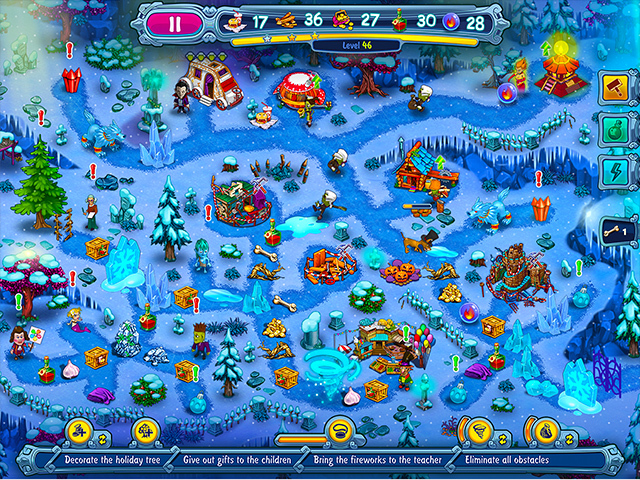 The storyline is fun, the graphics are amazing, even the sound effects fit the story so nicely. I also like the way the developers have made it feel more like a quest--you must acquire certain items before you can get others or finish the level. So much better than your goals being to "build a level 2 sawmill", etc. I also like the amount of players you get in each level; keeps the level moving along. Finally, you can play 50 levels without having to buy a collector's edition; you really get your money's worth. Hope there is a new Incredible Dracula soon to follow this one! Rated 5 out of 5 by cowclaudia from THIS I like! After that Game of Gods swore I'd never buy another Incredible Dracula and ate my words. Finally back to the "Drac" I know and love along with the zombies, Frankenstein, Vlad and the princess. 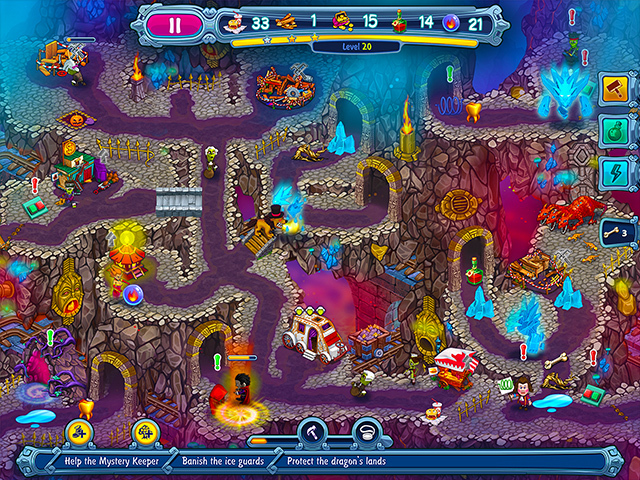 This time Dracula and friends are off to stop the Ice Queen from freezing up the planet and it's fun all the way. Follows pretty much the same game play; this time you have a fire station that creates "fireballs" to melt ice obstacles along with Blood Donalds (thank heaven no donuts), lumber mill, etc. Music is pleasant and doesn't distract from the game (like some does). Just one thing developer: Please bring back the "vampy" original wife and get rid of the Kewpie doll! 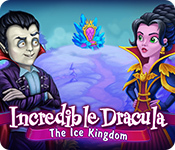 Rated 5 out of 5 by biscuitsmama from INCREDIBLE DRACULA THE ICE KINGDOM IS AN INCREDIBLE GAME! As you may know I mostly play and review HOPA games and have generally avoided the TM genre until a few years ago when the first Incredible Dracula game grabbed me and fired up my interest in the TM genre. I own every Incredible Dracula game and have eagerly been awaiting the next game and it is finally here. When I saw this morning’s game Incredible Dracula the Ice Kingdom I began doing my happy dance. I love, love, love Incredible Dracula and The Ice Kingdom continues the humorous and entertaining series. If you haven’t already discovered Incredible Dracula I heartily recommend that you try The Ice Kingdom and let the fun and laughs begin. The sound effects in this game are as usual but they still cause a chuckle to escape every time I hear them. The graphics are of exceptional quality and add to my enjoyment of this game as Dracula and his friends tackle the freezing cold this year. Incredible Dracula The Ice Kingdom was an instant purchase for me because this is the first TM series I fell in love with. With our cold and wet weather I now have a great game that will keep me warm and happy as I play with Dracula and his pals. Even though this game was an instant buy for me, as always, please try the demo to see if The Ice Kingdom is a game you will enjoy. Happy gaming!